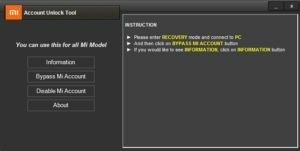 If you search a Mi Account Unlock Tool For PC Windows Free Download, So You Come to a right place this post link to a Remove Or Bypass Mi Cloud Recovery tools, now am share today a amazing 100% working Tool. This tool developed by Mobile Software Advance latest version of Mi Account Unlock Tool For PC Windows 7,8,10 supported MAX OS Operating System 32/64 Bit. 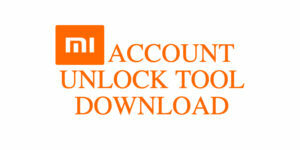 you can download Mi account unlock tool to bypass Mi account or to bypass Mi cloud verification. Developers: Mi Account Unlock Tool. First, Switch off your phone properly. Press and Hold Volume Up button + Power Button. Now Mi logo appears on the phone screen. Release the power button but don’t release volume button. Now connect your device to the computer and run the ‘Mi Account Unlock tool .exe file’ as an administrator from the Mi Account Unlock Tool folder. Now, click on ‘Information’ on the software to check if the device is connected properly. Then Click on Bypass Mi account. Now you all done, Enjoy the unlocked Mi account.